Why do people migrate? What steps does this movement require? What does it happen during the journey to the ‘promise land’? Das neue Deutschland, von Migration und Vielfalt, currently hosted in Dresden Hygiene Museum from March 8th to October 2nd 2014, investigates the matter taking into account today’s German case study, where the twenty per cent of those who now live here look back on a history of migration. The protagonists of this exhibition are all them, labelled as “people from a migrant background” in spite of the different reasons behind this choice (such as study, work at any qualification grade, love, previous persecution, famine or war). From here, the exhibition addresses the issue of the role this label play in a country that – as belonging to present global world – can’t be but characterised by diversity in any aspect of its existence. 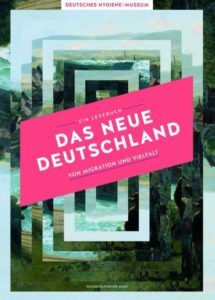 “Das neue Deutschland”, in fact, explores the issue as it stands today, and examines the direction in which Germany is evolving in its social and cultural diversity. In order to do this, the discourse is rather accessible to an audience of non-specialists, and exploits pop culture, products and situations of everyday common experience by any German (and in general by any other country of modern world) citizens. Moreover, to push further the potential identification by the audience and the protagonists, some sections of the exhibition are interactively built so to make the firsts live by direct experience the simulation of common situations migrants face (borders, check-in, metal detectors the visitor has to walk under the risk of being searched and scanned by the police (‘interpreted’ by the very same surveillance staff of the museum). Individual stories are put into relation with the ‘big history’ and issues related to migrations and cultural diversity in the past and today, and the display is entirely built on acknowledging visual and auditive pluralism at any level of the discourse. However, the result is not that of a cacophony, but that of a harmony made by the contemporary presence of different elements already solved in their mutual interactions, or micro-clashing with adjustments in reply. This within the general frame of acknowledging cultural diversity in modern countries as a ‘structural fact’ demanding approaches that must consider it as a reality, and not an extraordinary phenomenon characterised by the dimension of the emergency. Finally, a last room of the exhibition is organised as a series of white and black walls, portraits and writings in different dimensions, addressing general questions related to people movements, choices of life, sense of belonging expressed in poetic form – so to make the visitor reconnect the intellectual discourse to those instances that are simply ‘human’. Description of the different rooms/themes, and program of the activities can be found here. Many thanks to Isabel Dzierson.